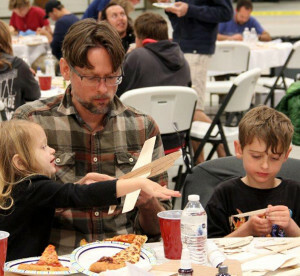 Serious business — Brodie Long, an engineer for The Spaceship Company builds model planes with his children Nora and Mike during Mojave’s Indoor RC and Glider Fly-in competition. Growing up in Oklahoma, Long said it took him 20 years to land his dream job in Mojave. 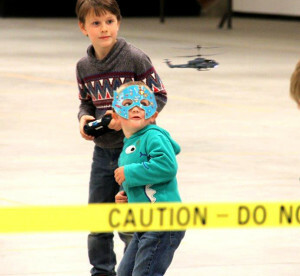 Flight enthusiasts of all ages gathered at the Stuart O. Witt Event Center at the Mojave Air and Space Port, April 14 to do what Mojave is best known for: to design, build and test experimental aircraft and to inspire the next generation. Participants of the third annual Indoor RC and Glider Fly-in event tested their skills by building various balsa wood, hand- launch gliders while others built their own creations. “These are one-of-a-kind, laser cut models designed and made just for this event,” explained Cam Martin from NASA Armstrong Flight Research Center, speaking of the balsa models. Each year new designs are introduced, often depicting a new aircraft conceived at Mojave. Martin encouraged beginners to build a Delta Dart model first because they are easy to build and almost impossible for them not to fly. Brodie Long, an engineer for The Spaceship Company brought his children, Nora and Mike for family entertainment and education. The model building event is a kick off for the Experimental Fly-in that takes place the following Saturday. While working for Scaled Composites, Seguin said he helped to recruit employees for the Stratolaunch program for SpaceShipTwo. Chad and Tyler Sanders display their modified turbine powered Schweizer 1-26 sailplane that they built while studying for their aerospace engineering degrees at San Jose State University during Mojave’s Experimental Fly-in. Instead of going to job fairs and begging colleges for their brightest students, Seguin explained that Mojave was looking for specific personalities, not just brains. “For the type of work we do here, a lot of it is proprietary, we just can’t keep our doors open all of the time … having the fly-in brings people who are like-minded, people who eat, breath and are defined by aerospace. It’s sort of like opening a Willie Wonka for aerospace freaks,” admitting that he is probably one of the biggest freaks of all time. Both events give designers and pilots a chance to display their creations and ideas. “There may be a person building the most awesome thing in their basement, but what if they are shy or don’t know how to make it go further? They can bring it here and share it, and we can help them — this is a podium to share and learn and be inspired,” said Seguin. Enjoying beautiful weather, guests came from across the country and even enticed vacationers from Switzerland. “We are lucky, we know about Mojave and this event just happened to be going on while we are in California,” said Daniel Rytz while checking out an F-8 with his son, Thomas. Daniel said he has loved aircraft all his life. “I’m not a pilot but I like to photograph airplanes, it’s much cheaper than flying them,” he laughed. 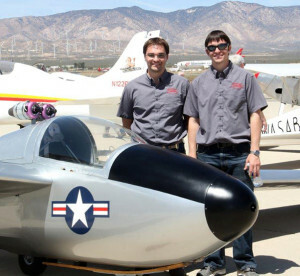 Chad and Tyler Sanders displayed their modified turbine powered Schweizer 1-26 sailplane that they built while studying for their aerospace engineering degrees at San Jose State University. Coming from a family that restores World War II aircraft, the two brothers said that they had all the tools they needed to modify the aircraft, and that it was quite an affordable project. “We used every asset of engineering we learned in school- electrical, structural, aerodynamics, fluid flow — it was a super unique opportunity,” explained Chad, 26, who works for NASA Ames Research Center. U2 Pilot Rob “Skid” Rowe shares his humorous adventures while working with his life time heroes, Art Thomson of Sage Cheshire and the first man to freefall from outer space, Joe Kittinger. Rowe was responsible for certifying the Red Bull Stratos capsule that was designed and built by Thompson. Kittinger jumped 102,800 feet in 1960, holding that record for 54 years. Felix Baumgartner jumped 128,146 feet on Oct 14, 2012 and two years later on Oct 25, 2014, Google executive Alan Eustace broke Baumgartner’s record by freefalling 135,908 feet. “We got to design and fabricate it 100 percent of how we wanted it,” added Tyler who works for Lockheed Martin in Palmdale. Instead of using a tow plane, their glider has two model jet engines that retract when not needed. Sponsored by the Mojave Transportation Museum, guest speaker Rob “Skid” Rowe shared a humorous side of his experience with the Red Bull Stratos project in which skydiving daredevil Felix Baumgartner set a world’s record by jumping 128,100 feet out of a capsule, reaching a speed of Mach 1.25 on Oct. 14, 2012. Rowe was recruited to the Red Bull project because of his experience in flying the high-altitude U-2 Dragon Lady, which requires pilots to wear a spacesuit, often flying over 70,000 feet, twice as high as an airliner. A retired U.S. Air Force and Lockheed Martin test pilot, Rowe holds the world record in flight time logging 5,419 hours in the spy plane. 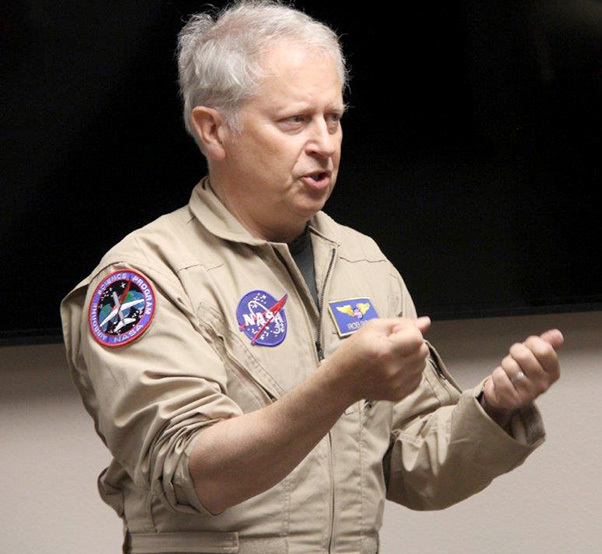 Recently, he joined NASA Armstrong flying the Gulf Stream III and the civilian version of the U-2, the ER-2. 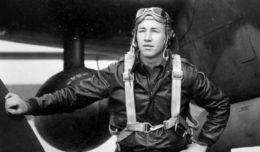 Speaking about his two heroes of all time, Art Thompson of Sage Cheshire and Joe Kittinger, the first man to jump from outer space, Rowe used his expertise to certify the Red Bull Capsule that Thompson designed and built. “We pack a guy in a space suit to avoid those uncomfortable formalities of dying,” said Rowe, explaining that a ‘wizard of a doctor’ figured out that blood boils at 62,000 feet. If pressure is lost in a capsule, the suit will provide protection above 50,000 feet. “It’s the line the Air Force calls the Sacred Cow.” Anything below that line, a helmet and oxygen are all that is needed. Children have fun building and flying model planes during Mojave’s third annual RC and Glider Fly-in competition in the Stuart O. Witt Event Center. Kids of all ages ate pizza and built their own designs or built a model airplane that was designed and laser cut for this specific event. “If you pick up your digital distractions and Google Felix Baumgartner, you will see him jumping off the right hand of God,” Rowe said speaking of the Christ statue in Rio de Janeiro. “This guy obviously has the wherewithal and kahunas to do something dramatic- perfect for Red Bull,” said Rowe, however, Baumgartner was claustrophobic and often spoke of quitting the project. Kittinger talked to Baumgartner during the jump, calming his nerves as he broke Kittinger’s record set on Aug 16, 1960 at 102,800 feet. According to Rowe, Baumgartner was paid $3.9 million for his participation in the Red Bull project and is now happily retired.